According to rabbinical opinion, Beheading was one of the accepted modes of execution in the Bible (Mishnah Sanh. vii. 1). Murder and idolatry (when committed by a whole city, Deut. xiii. 14) were the crimes punishable with Beheading (Mishnah Sanh. ix. 1; Mek., Mishpaṭim, 4; Sifre, Deut. 94). Punishing a slave so severely that death followed within twenty-fourhours, was accounted murder; and the guilty master was punished capitally (Mek., Mishpaṭim, 7). The mode of procedure in Beheading is a matter of dispute, even as early as the Tannaites of the second century, some of whom maintained that the criminal’s head was struck off with a sword, “the way the government does”; while, according to R. Judah ben Ilai, the neck of the victim was placed against a block, and the head hewn off with an ax (Mishnah Sanh. vii. 3). This discussion between R. Judah and his opponents (Tosef., Sanh. ix., end; Gem. ib. 52b) reveals the fact that Beheading, as a mode of execution, must have been adopted in late years from other nations—Assyria or Persia, Greece or Rome. The very question, whether ax or sword should be employed, is intelligible only on the supposition that Beheading was a foreign procedure, and one, therefore, not determined by law or custom. It is known that the Roman emperors adopted the use of the sword in lieu of the ax. For the same reason, Beheading was the only mode of execution which a Jewish king might employ, other current modes mentioned in Scripture being reserved for the established courts of law; a king may only claim, as royal privilege, that which kings customarily demand (Maimonides, “Yad ha-Ḥazaḳah,” Sanh. xiv. 2; ib., Melakim, iii. 8, following the Tosefta, Sanh. vii. 3; Yer. Sanh. vii. 24b). Beheading was accounted one of the least painful modes of execution; according to the view of R. Simeon, it was the least painful (Mishnah, ib. vii. 1). It was customary to have two different burial-places for executed criminals: one for those who had sufered death by stoning or by fire; the other, for those beheaded or strangled. The punishment was considered a measure of the crime; and it was not deemed right to bury criminals of a minor degree among those of greater wickedness (Tosef., Sanh. ix. 9; Mishnah, vi. 5; Gem. 47b). Rabbi Yosef Berger, one of the rabbis in charge of King David’s Tomb in Jerusalem’s Old City, has been dreaming of a project for over a year – one Torah scroll to unify all of Israel. Recent global events have forced Rabbi Berger to move ahead quickly with his dream as he wants to be able to personally present this Torah as a gift to the Messiah. Many prominent rabbis and Kabbalists have told Rabbi Berger that may be very soon indeed. 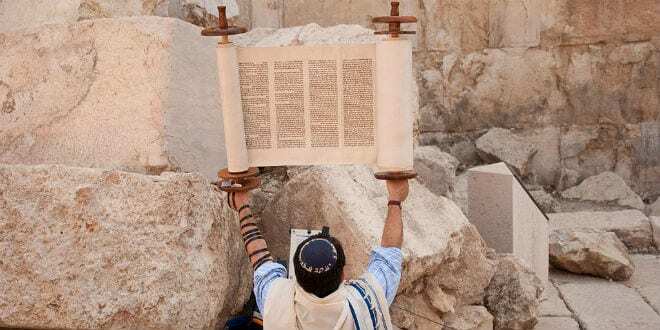 Rabbi Berger explained to Breaking Israel News what this prophecy had a personal meaning for him. “In the end of days, when Israel realizes that all hope is lost and they have no solution or salvation from their plight, the people of Israel will be wise enough to seek the three things which our ancestors despised: the Kingdom of Heaven, the Kingdom of David, and the building of the Temple,” he said. Rabbi Berger believes that by bringing all of Israel together in the writing of a single Torah scroll housed on Mount Zion, where King David is interred, and adjacent to the Temple mount, he will accomplish all three goals in one action. Rabbi David Hai Abuhatzeira was honored with writing the first letter of the Torah. Rabbi Abuhatzeira is the grandson of the prominent Moroccan Sephardic mystic Rabbi Israel Abuhatzeira, known as the Baba Sali, renowned for his ability to work miracles through his prayers. According to Rabbi Berger, Rabbi Abuhatzeira added that the combined numerologies of the phrases “This year we will merit seeing him” (השנה נזכה לראות אותו) and “The arrival of the Messiah” (ביאת המשי), add up to 5776, the current year according to the Jewish calendar. Hundreds of letters have already been written in the Torah scroll. Jewish tradition teaches that a Torah scroll contains 600,000 letters, equal to the number of Jews who received the Torah at Mount Sinai. However, the actual number of letters in a Torah is 304,805, leaving many more opportunities for people to be included in the Klal Yisrael project. Rabbi Berger realizes that preparing a gift for the Messiah is not a normal type of charity, and his expectations are unique. “Even if someone gives me a million dollars to write many Torahs, it isn’t what I want. I want all of Israel individually to have a part in this Torah,” he explained to Breaking Israel News. When the Torah is completed, Rabbi Berger plans on having a parade through Jerusalem to dedicate it. 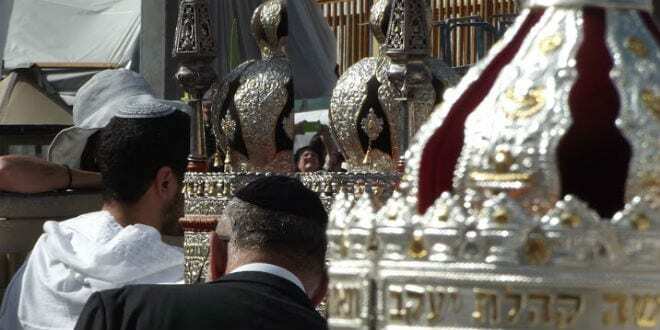 The parade will go through every corner of the city in order to include as many people as possible and will finish at the Tomb of King David, where the Torah scroll will be kept.